Rick Perry: Is His Real Problem Insincerity? This entry was posted on Tuesday, August 30th, 2011 at 20:24 and is filed under Election 2012, GOP Candidates, Politics. Can the Spurs be Far Behind? It’s been just more than 24 hours since I defended Rick Perry against the smear by Jonathan Martin about his intelligence, but today, a bit of information arrives to more strongly suggest that Mr. Perry has other problems. In addition to the other instances in which his conservative credentials have come into question, now arises the question of his tacit support for Hillary Clinton’s healthcare plan of 1993. 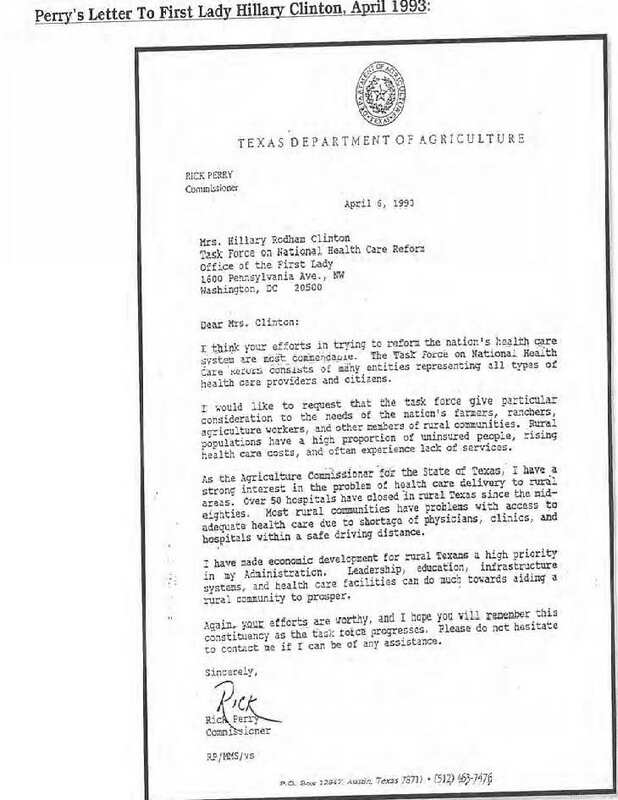 In a letter to Mrs. Clinton, then Agriculture Commissioner expressed support for the ill-fated overhaul plan. Many are inclined to ignore this because in addition to being an eighteen year old letter, everybody knows Rick Perry had been a Democrat before becoming a Republican, so the thinking is that this should present no problem. Unfortunately, Rick Perry had already changed parties in order to run for the post as Agriculture Commissioner, the post in which he served at the time of the letter. Rather than questioning Rick Perry’s intelligence as does the leftist media, I believe we conservatives must ask a much more serious question about the sincerity of his most deeply held philosophical underpinnings. Does he mean it? Is it just an act? Is he really a conservative? Changing political parties is not unusual. Politicians do it frequently, and in several watershed election years, waves of elected officials have done so. Still, for the electorate, a change of parties generally also signifies a change in underlying philosophy. I was raised in a household and extended family consisting entirely of liberal Democrats, such that virtually nothing I said about politics prior to 1983 would be in agreement with my positions some three decades later. My conversion was different from Rick Perry’s, in that before I changed parties, I had changed my outlook. Philosophy drove my political affiliations, but not the reverse. This is how most people come to make a change: Their knowledge, experience, and ultimately, their philosophy changes, and this leads to a change of parties. This is not necessarily the case among professional politicians. All too frequently, their change in political party is instantaneous and without apparent philosophical reflection or study. Instead, they are frequently motivated solely by the desire to win. The letter from Rick Perry to Hillary Clinton is indicative of this same trend. Perry had been a Republican for four years before writing this letter, leading one to wonder if his party conversion hadn’t been a matter of political convenience rather than a deeply held philosophical awakening. Once you realize this, the rest of his record begins to make sense. Over the period defined by his electoral career, the general political atmosphere in Texas has been steadily creeping from left to right, with only a few aberrations. Rick Perry’s apparent political position has closely mirrored this shift, from Democrat to Republican moderate to GOP establishment to conservative, and finally to Tea Party. This is an odd sort of conversion, particularly measured against the sort of conversion most ordinary Americans may at some point undergo. Instead, it looks like a conversion of political convenience, born not of deeply stirring study and thorough argumentation, but of calculations in the back rooms of Texas political expediency. What was the moment of conversion? What was that issue that cinched it for Mr. Perry? The elections of 1994 caused similar spontaneous conversions for elected officials all across Texas, but Mr. Perry’s party conversion five years earlier simply suggests he was out ahead of the curve. Writing a letter such as this, we know he was not a conservative in 1993. Did the elections eighteen months later convince him? With this in mind, the other issues that arise with respect to Perry’s more recent acts that seem in opposition to conservative principles begin to make more sense. A reflexive action to mandate Gardasil? His remarks on his belief in an open border? His chameleon-like sliding in and out of La Raza and ACORN events? The TransTexas Corridor? Now, knowing this, and having seen this letter begins to put in context what a few seeming aberrations couldn’t quite nail down. Perry may be a conservative today, a Tea Party member tomorrow, or a member of the John Birch Society yesterday. Next week, he’s likely to be a globalist, a corporatist, or frankly, anything under the sun. He’s shifting, but his reflexes indicate he still suffers from a fundamental misunderstanding of what is conservatism, because he doesn’t really mean it. His re-election campaign of 2010 along with his election campaign this year seem to bleed the standard stereotypes of a southern, Christian conservative. In truth, he’s becoming a caricature that hardly resembles most Texas conservatives due in part to its gross overstatement. One almost expects him to show up at a rally with a six-shooter, wearing spurs and a Stetson. Actually, he’s already done that. Mr. Perry isn’t a conservative. He’s playing a role. He’s doing what he believes it will take to get elected. His record is thick with instances in which he did not behave as a conservative, or even a Republican, and all well after his conversion to the GOP. This is the real problem with Rick Perry. He’s not “dumb,” he’s insincere. He’s a political opportunist who has great instincts for getting out ahead of his electorate in form, but in function, he remains what he has always been: A political actor. If he goes on to win the nomination, he’ll have deserved an Oscar. 7 Responses to Rick Perry: Is His Real Problem Insincerity? Spot on! I've worried about a potential Rick Perry candidacy since well before last year. I seem to remember that he had told certain people that he would not run for re-election in 2010, which paved the way for Kay Baily Hutchinson to make a run in his absence. It seems that he reneged on his word and made Kay a foil of his ambitions. I'll never forget that. Although I didn't hold Kay Baily Hutchinson in high regard as a Washington conservative, I would have supported her for the governorship. Something about the way that Rick Perry threw her under the bus doesn't quite settle with me. There seems to be an ambition in Rick Perry that transcends the proverbial handshake. I don't believe that he has seen a "calling", as Glenn Beck would have it. I believe he sees an opportunity to advance a message of change that is not unlike Obama in 2008. I can only hope that true conservatives and Tea Party members are not duped. There is something about Rick Perry that I just don't trust. I'm with you across the board on this. He's been a Republican since I've been a Texan, and what I've noted is that he always reaches back to the statist playbook. 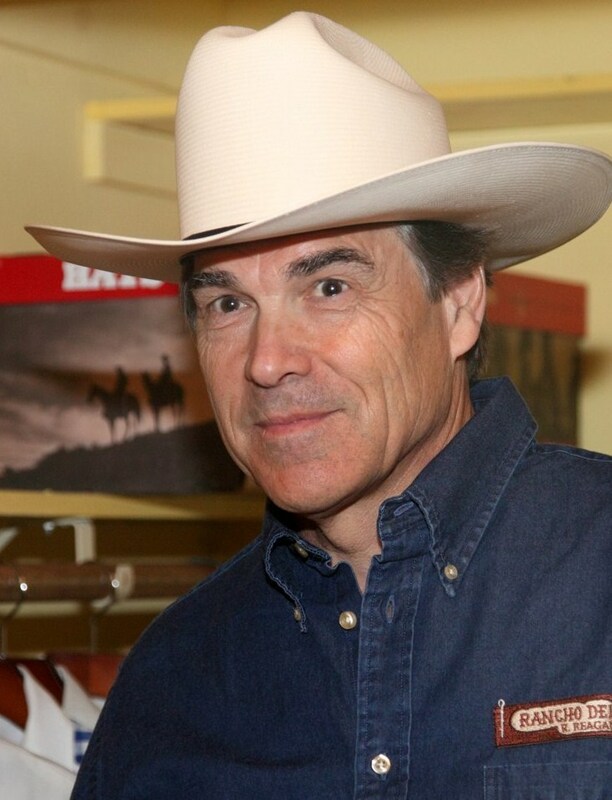 Aside from the political catch-as-catch can and intrigues of the situation, obviously Perry is a very good looking guy. It would be extraordinary (to the point of near impossibility) if there weren't a few not-so-skeletal skeletons in his closet. That would be a shame for a number of reasons which you can imagine. Not the least of which being that any info surfacing to that effect will be kept in hand by the activist media until the penultimate moment,—moreso, should he be the nominee. You bet, Dennis. Perry's got lots of skeletons, and you can bet the Democrats will save them for the general election. One of the advantages of a Palin candidacy is that they've already thrown everything they had, plus things they've invented at her. One of the reasons I think she gets in before 1 October. Mark, I think Palin would be an outstanding President. What the popular media has done (and continues to do) to her and her family is unprecedented and almost, but not quite, beneath contempt. I never thought I'd see the day when the NYT had less credibility than the Nartional Enquirer, and read like a marxist college rag from the 60s….but there we go. In case you haven't seen these articles about Rick Perry. Love your articles, thank you.